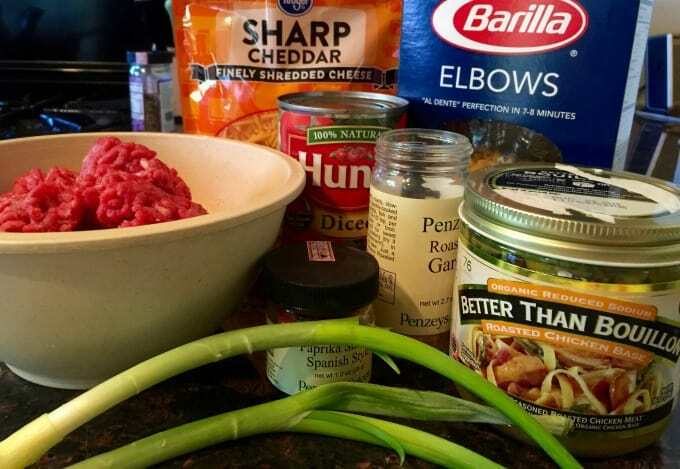 Today I’m sharing a recipe for skinny cheeseburger pasta, aka homemade hamburger helper, a one pot skillet meal that’s sure to please the entire family. It did mine. 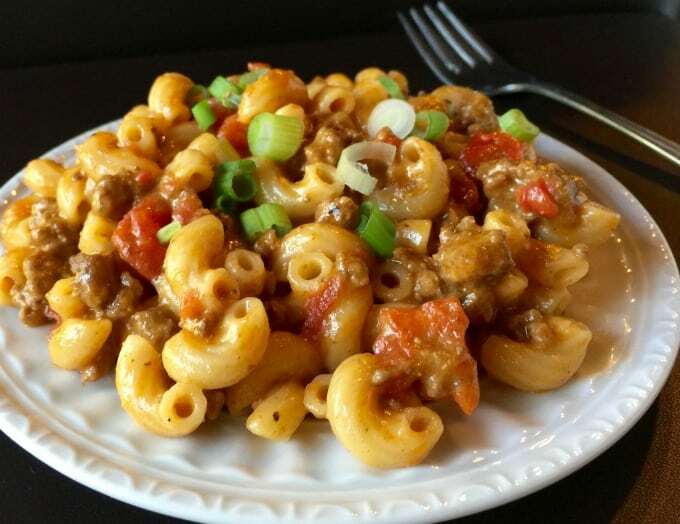 How Many Calories/Weight Watchers Points in this Skinny Cheeseburger Pasta One Pot Skillet? According to my calculations each generous 1-cup serving has 350 calories and *7 Weight Watchers Freestyle SmartPoints. As soon as I discovered the recipe for an easy cheesy homemade hamburger helper in a Slimming World magazine I knew I wanted to try it. The only change I made was to substitute granulated roasted garlic for fresh, since I didn’t have any on hand. I also adjusted the serving size from 4 to 6 to lower the calories and Weight Watchers Freestyle SmartPoints. With a side salad alongside, this cheeseburger pasta made for a satisfying dinner. Substitute ground beef with vegetarian crumbles, cooked lentils or beans and vegetable broth (affiliate link) for the chicken broth. Replace the can of diced tomatoes with a can of zesty fire-roasted ones with diced chiles. Add chopped zucchini, cauliflower or corn in step 2 of the recipe instructions. Or add chopped onions and/or bell peppers to the ground beef in step 1. Use whatever small cut of pasta you prefer and have on hand, such as shells, fusilli or penne. Lightly coat a large nonstick skillet with cooking spray and set over medium-high heat until hot. Add the beef and cook, breaking into smaller pieces with a wooden spoon (affiliate link), until browned, 5 to 7 minutes. Stir in the garlic powder and smoked paprika and cook for 30 seconds or so. Add the chicken broth, tomatoes, macaroni, and ½ teaspoon salt and bring to a simmer. 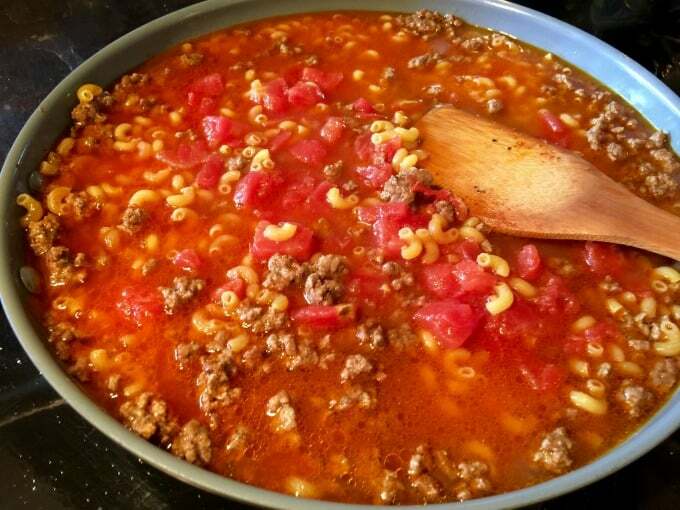 Cook, stirring often, until the macaroni is tender and the sauce has thickened, 10 to 15 minutes. Remove skillet from the heat and stir in the cheese until well blended and melted. Divide mixture evenly among six plates or bowls. Sprinkle with scallions. Enjoy alone or with a green salad! 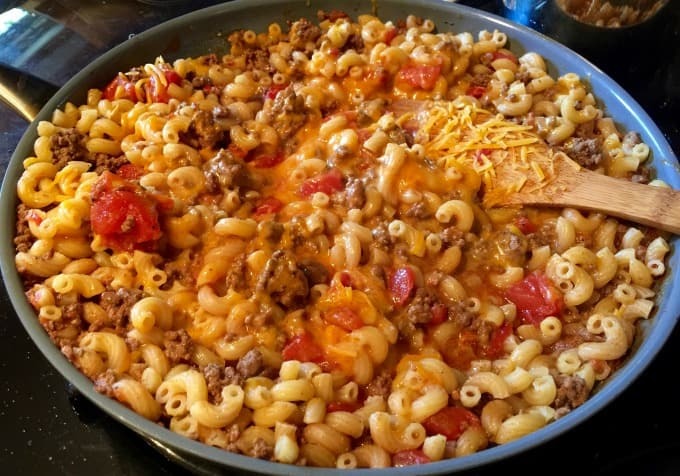 If you’ve made this One-Pot Cheeseburger Pasta Skillet, please give the recipe a star rating below and leave a comment letting me know how you liked it. 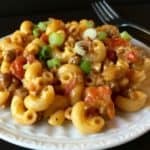 A comfort food favorite - lean ground beef, chicken broth, tomatoes, macaroni and cheese combine for an easy healthy one pot dinner the entire family will love. It's like hamburger helper only better because it is homemade! Lightly coat a large nonstick skillet with cooking spray and set over medium-high heat until hot. Add the beef and cook, breaking into smaller pieces with a wooden spoon, until browned, 5 to 7 minutes. Stir in the garlic powder and smoked paprika and cook for 30 seconds or so. Add the chicken broth, tomatoes, macaroni, and 1/2 teaspoon salt and bring to a simmer. Cook, stirring often, until the macaroni is tender and the sauce has thickened, 10 to 15 minutes. Divide mixture evenly among six plates or bowls. Sprinkle with scallions. No ground beef? Substitute ground turkey or chicken or chicken/turkey sausage. Vegetarian? Substitute ground beef with vegetarian crumbles, cooked lentils or beans and vegetable broth for the chicken broth. Spicier? Replace the can of diced tomatoes with a can of zesty fire-roasted ones with diced chiles. More veg? Add chopped zucchini, cauliflower or corn in step 2 of the recipe instructions. Or add chopped onions and/or bell peppers to the ground beef in step 1. No elbow pasta? Use whatever small cut of pasta you prefer and have on hand, such as shells, fusilli or penne. 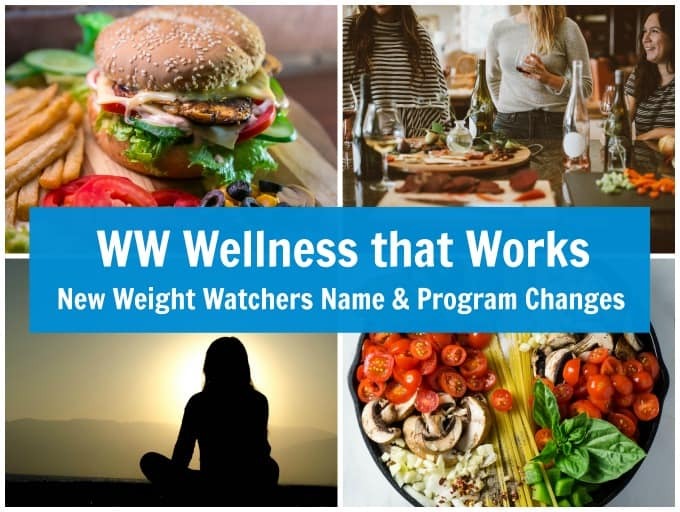 Previous Post: « Weight Loss Success Story – Marie D.
I am on the old point system. How can I compare old points with new freestyle points? 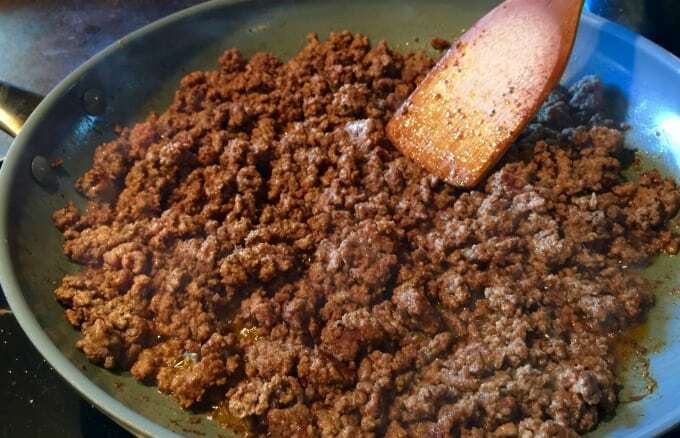 If I make it with ground turkey does that lower the points? I only have 2 in my household so I won’t be dividing it onto 6 plates. Do you have an approximate serving size for each portion? I wish it included Freestyle Points when using ground turkey. I’m so lazy I didn’t want to compute it on my own. Could I make this I. A crock pot? Has anyone tried to? I do Simply Filling. I could just substitute the elbow Pasta for Whole Wheat and then walahhh !! Do you add in the elbow macaroni dry, or does it have to be cooked first? If you add it in dry, does it cook all the way without being boiled first?